Wednesday marked a momentous occasion in little Puff’s life. Yet another one of the many milestones (and baby book pages) to leave behind on her way to becoming a full-fledged CHILD. 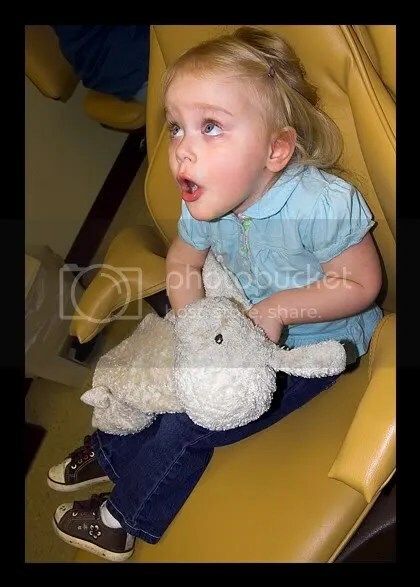 Her first trip to the dentist. Puff, of course, was thrilled at the prospect of a new experience. I made sure that she would be. We watched the Elmo’s World segment about teeth several thousand times (thank goodness it was On Demand this month! ), which included a short about a kid and his first trip to the dentist. I explained every bit of what she had to expect in great detail. . .over and over. I told Puff about the super buzzy tooth-brush, and the spit sucker, and the X-ray machine. . . I even told her that dentists wear masks, just so it wouldn’t be scary for her when the time came. Puff was excited. Puff sat on my lap and behaved perfectly through her cleaning. I could tell that she didn’t really enjoy it, but she didn’t whine or squirm, and Dr. Al was as gentle as he could be. 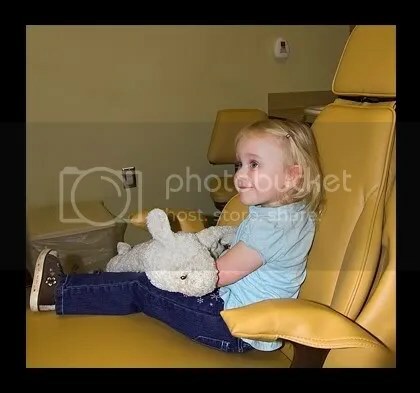 She even sat still and followed instructions well enough for the technician to get x-rays of her teeth – while I watched nervously from the doorway. Everyone in the office was impressed by her goodness and amazing command of the English language. It’s always nice to hear strangers gushing about your kid! Her teeth look great, though there is one teensy shadowy spot on one tooth. Doc thinks it’s just some discoloration that grew in with the tooth, and is nothing to worry about. But just in case, we’ll be keeping a close eye on it and will brush it extra-especially well. We don’t want any cavities on those tiny pearls! 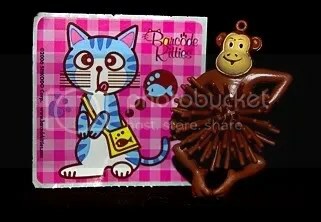 And of course, after all was said and done, Puff was permitted to pick a bit of plastic junk and a sticker out of the prize drawer! AND they gave her a Happy Halloween sticker and a hoppy spider to add to her ever-growing collection of hoppy spiders. She ALSO got a brand-new toothbrush! It’s a WHALE toothbrush, which is awesome, because it goes along with her most favorite and amazing whale-shaped bath soap. Subtleties like this make Puff’s day. She’s sold. Totally. 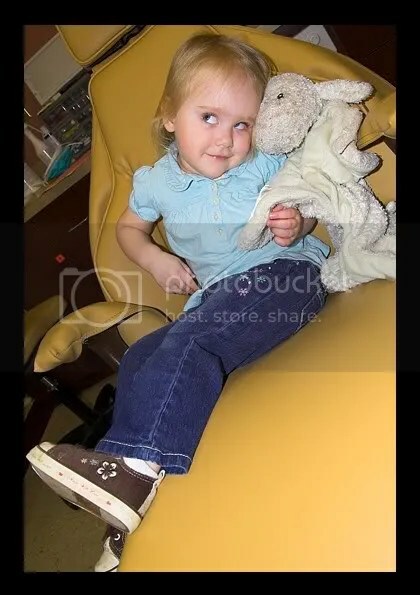 She asked me this morning if we could go to the dentist today. She must be a zombie. And I can’t run away. . . at least she’s a cute one! some of the spoils of the day. . .
P.S. The dentist’s office weighed Super Puff in at 30 pounds! Do you BELIEVE that my tiny 10th percentile baby has become a strapping 30-pound toddler?! Astounding. . .
You did a great job documenting this momentous occasion !!! She is an absolute doll!!! She did great! You should be a proud Mama. Madalyn has no trust in anyone. She didn’t even want to let the lady at the shoe store measure her feet even after watching Marissa get hers done. Yeah for a great visit! Tori has gone to watch Mark and myself. We don’t have cavities or anything that would make her uneasy, so it’s been an ok experience. She’ll be going for her cleaning soon. On a side note, my Tori is such a string-bean. She weighed in at 23 lbs on Tuesday. She’s older than T ! I know, not by much, but still…ug. Cheshling, your writing style rocks. You had me laughing under my breath the whole time. I love your documentation of this experience. Puff is adorable, and yes, you’ve turned her into a zombie. Way to go! Success! i’m not gonna lie to you, cus why would i? i used to throw those reminder postcards away so that my mom would lose track of time in the dentist world. nowadays i just stay as far away as possible. i’m sorry, i don’t like people prodding sensitive areas with sharp objects. so sue me. Awe! I am so proud of her! Even I hate the dentist! She looks to pretty with Lamby! how cute! What a cutie pie. And isn’t it amazing how fun they’ve made it for kids to go to the dentist? Back in “my day” (yes, I feel old saying that), we just went to the adult dentist and were tortured with nauseating flouride. Now my kids jump up and down and count down the days when I tell them it’s time to go to the dentist! 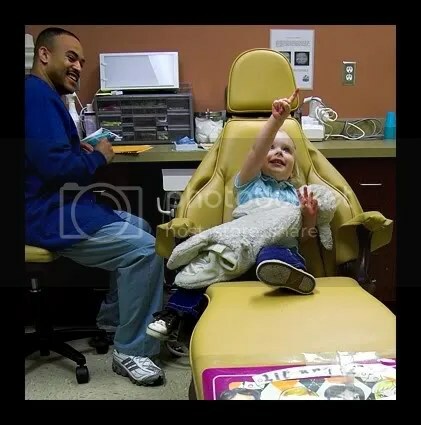 This post reminded me of the first time I took my oldest to the dentist! 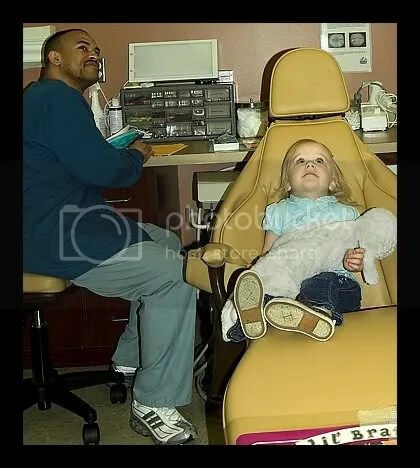 Ah, it was a fun memory even though it was the dentist! She sure is growing up! I still think its weird that she liked it, but I am SO relieved that it worked out that way!